Jameson Rd is a popular access to Ammonite Falls and Benson Creek Falls Regional Park. Increased parking volumes along Jameson Rd and Creekside Place have caused traffic congestion and unsafe access to driveways. The RDN, Ministry of Transportation and the RCMP are working together to improve the situation. 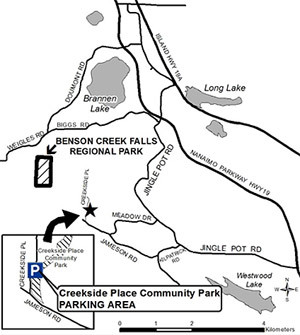 In the fall 2014 the Creekside Place Community Park parking lot was expanded and upgraded to fit 24 vehicles. Visitors are requested to drive 200m metres down the hill to the parking lot and then walk in. 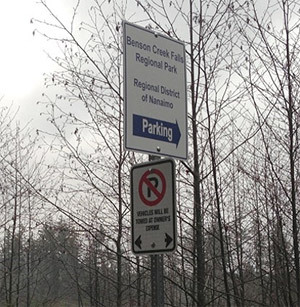 No Parking/Towing signs have also been installed, reminding people not to park along Jameson Rd or Creekside Place, but instead use the parking lot. Visitors are advised they risk being towed if parked on Jameson Road or Creekside Place. Enforcement is also happening with the RCMP conducting regular patrols of the area for traffic safety and parking compliance. Vehicles parked on Jameson Rd and Creekside Place will be towed at owners' expense. If you did park on Jameson Rd or Creekside Place and you come back to find your vehicle gone, check first with Mid Island Towing at 250.758.1728 (available 24/7) or call the 24-hour RCMP non-emergency line (250.754.2345). The vehicle owner is responsible to retrieve their towed vehicle from the towing compound and pay all fines and expenses. Please report traffic violations and parking issues at Jameson Rd and Creekside Place to the 24-hour RCMP non-emergency line (250.754.2345).